WHAT IS THE COST OF SOLAR PANELS THIS 2019? It’s cheap: a solar panel system costs two iPhones or half a car. It isn’t just about weighing the effects of fossil fuels versus solar panels in the Philippines. Go deeper into considering the significant returns of the solar panel system over the course of 20 to 25 years. Imagine if most homes, buildings, factories, warehouses, and business establishments installed solar panels. The entire nation would increase its solar power capacity multiple times. Our annual carbon dioxide emissions from energy use would diminish. We would contribute to the environment instead of destroying it with the effects of traditional energy sources. We would incur significant savings in utility costs. We would directly be responsible for a cleaner, safer, and healthier planet. What is the average cost of solar panels? Solar panels will reduce your overall total costs on power in your lifetime. There are upfront costs to consider. This shows that the average solar panel system cost in the Philippines is Php128,500 for a 1.62 kWp solar system. The good news is that the cost of panels only continues to fall year after year. As technology advances, rates drop, and solar power becomes cheaper to produce. In order to get a solar panel system, it’s important to keep in mind that the cost can vary significantly based on various factors: roof type and space, sun exposure, daytime appliances used, monthly electric bill or power consumption, solar panel system size, quality, installation, labor, installation, brand, location or city, etc. Another crucial factor is your objective. Do you simply want to reduce your power bill? Or do you want a Zero Bill? Solaric has established its name across the renewable industry as a proven and reputable rooftop solar leader. 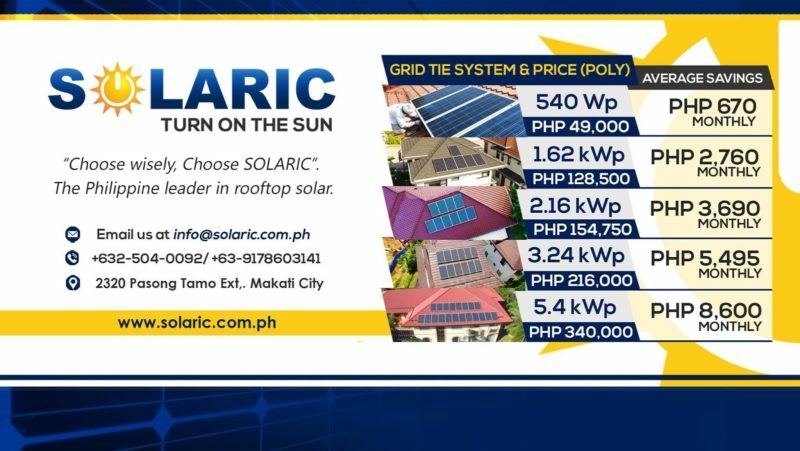 Backed by decades of experience, Solaric has installed more than 50% of residential rooftop solar panels in the Philippines and has delivered significant cost reductions in electricity expenses, as well as milestone contributions to a cleaner, greener, and renewable future. Solaric is now zoning in on corporate and industrial projects to offer them the same cost reductions. Solaric is the recognized leader in solar panel installations in the Philippines. The Solaric installers and engineers are well-known troubleshooting experts. They work hard to ensure that solar panel systems run efficiently and seamlessly, so that every single homeowner with rooftop solar can enjoy the benefits of clean and renewable power. Welcome to the new generation of solar and turning on the sun.